This beautiful angelic artwork, was created by Visionary Artist and Angel Communicator, Lori Daniel Falk. 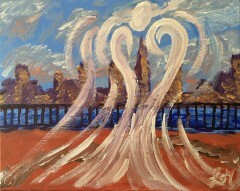 A few years back I created this acrylic on canvas portrait which is a view of the New York Skyline. 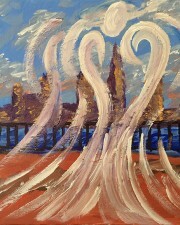 When it was nearly complete I was compelled to paint a large white angel on it. The Empire State Building is in the heart of the angel. Perhaps it was the real “Angel of the Hudson” who helped to create the “Miracle on the Hudson” that came to me in such a strong way. It was truly as if my hand was being guided by her to let her presence be known. Now that’s magical. For those of you who may not know, US Airways Flight 1549 was an Airbus A320-214 which, in the climb out after takeoff from New York City’s LaGuardia Airport on January 15, 2009, struck a flock of Canada geese just northeast of the George Washington Bridge and consequently lost all engine power. Unable to reach any airport, pilots Chesley Sullenberger and Jeffrey Skiles glided the plane to a ditching in the Hudson River off Midtown Manhattan. All 155 people aboard were rescued by nearby boats and there were few serious injuries. 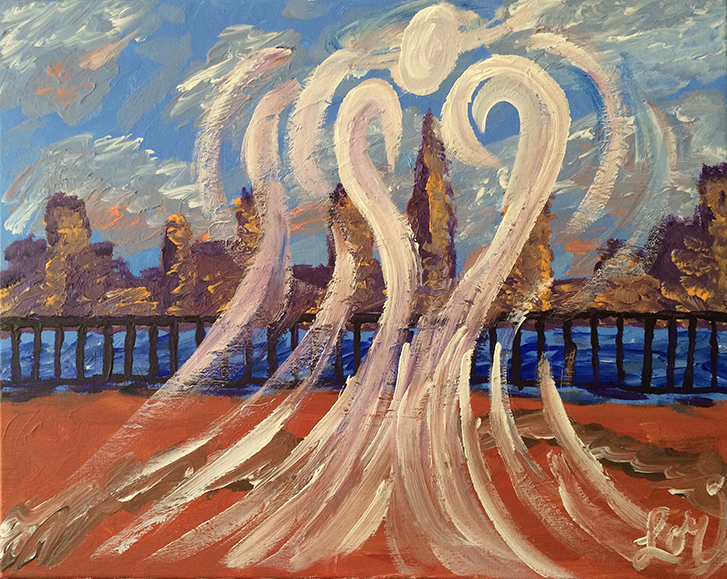 Order Your Angel of the Hudson Prints today! Now available in Wrapped Canvas Prints made from an additive-free cotton-poly blend that features a special ink-receptive coating that protects the printed surface from cracking when stretched. Prints are fade-resistant for 75 years or more.